Washington: Thousands of women marched on Saturday in the US capital and across the country to convey a now-annual message opposing Donald Trump and supporting women’s rights, but internal divisions appeared to steal some energy from the rallies. 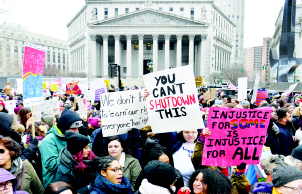 In Washington, demonstrators arriving by car, bus or subway converged on the city’s Freedom Plaza and marched defiantly past the nearby Trump International Hotel on Pennsylvania Avenue. Others decried his comments about women or minority groups, while many demanded his impeachment. As in earlier years, thousands of women joined demonstrations in cities across the United States, and around the world, though most turnouts appeared far short of the earlier women’s events. In contrast to the 2017 march, which drew more than three million nationwide, and last year’s event, when hundreds of thousands rallied, Washington police said they expected perhaps 20,000 demonstrators this year. Activists are also motivated by the fight over the Trump administration’s policy – since suspended – of separating undocumented parents from children at the border with Mexico. The anti-Semitism controversy stems from march co-founder Tamika Mallory’s ties to controversial Nation of Islam leader Louis Farrakhan and her failure to condemn disparaging remarks about Jews he made at an event she attended. Teresa Shook, the first woman to float the idea of a women’s march, has called for the movement’s four co-presidents — Mallory, Carmen Perez, Linda Sarsour and Bob Bland — to resign.